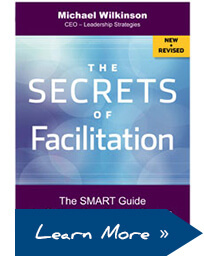 Prepare to become a Certified Master Facilitator! The Certified Master Facilitator™ (CMF) designation is the highest level of certification available to facilitators. By integrating The Effective Facilitator with the 30 CMF sub-competencies, you receive a dynamic, power-packed five-day* session that gives you everything you need to prepare for certification! *Alumni of The Effective Facilitator or Accelerated Workshop need only register for the last two days to receive CMF guidance and a videotape that can be submitted for CMF certification. Facilitators who met the requirements of INIFAC, including having facilitated a minimum of 30 sessions within the past 3 years. Get the qualifications you need to achieve the prestigious granted by The International Institute for Facilitation (INIFAC). Become highly skilled in the 30 CMF competencies and sub-competencies that are recognized by this certification. Special feature: Through our special arrangement with the CMF certifying body, you will receive a videotape of your facilitation that can be submitted for CMF certification! The International Institute for Facilitation (INIFAC) grants the prestigious Certified Master Facilitator™ (CMF) designation. To become certified, you must submit a list of your facilitation experiences, a list of references, a written application that responds to the 30 CMF sub-competencies, and a videotape of you facilitating a session assigned by INIFAC. The videotape must meet stringent INIFAC requirements designed to ensure the integrity of the process. As a INIFAC partner, we are one of the leading organizations in preparing facilitators for the CMF. We work on your behalf to have the INIFAC materials you need so the videotape created in the class can be submitted to INIFAC for certification. We also provide training in the skills and techniques you need that cover the 30 sub-competencies. Following the class, you will be able to complete the written assessment with confidence and submit the videotape, along with your references and experience list, for INIFAC certification. See the INIFAC website for details on the certification requirements.